Bianco White Carrara marble 1 in. x 2 in. basketweave mosaic tile is perfect marble tile for any accent wall or floor covering project. 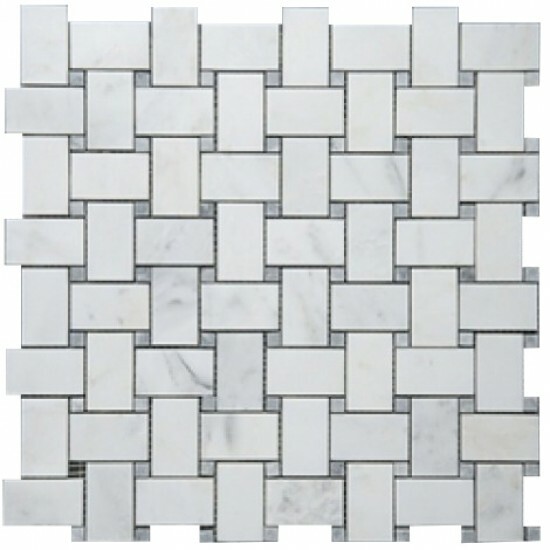 This white Carrara Marble tile comes in the form of 12” x 12” mesh mounted mosaic sheet, which approximately covers 1 sqft. The surface finish of the tile is polished, a smooth shiny finish which brings life to space. This white with grey dot basketweave tile is suggested for installation in kitchen backsplash, bathroom flooring, bathtub surround, accent wall tile. Our premium white basketweave mosaic tile comes with a large selection of coordinating products such as 12x12, 18x18, 24x24 solid field tiles, subway tiles, trims & moldings, borders and much more.